Get your Headcoats on again… Cos it’s time for four re-issues of long lost Thee Headcoatees albums that were originally released on Vinyl Japan in the 1990’s. Now available again on RED Vinyl and lovely Digi-pak CD’s and also for the first time as downloads. 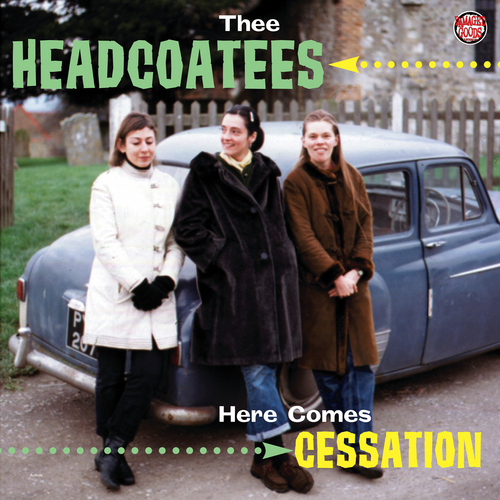 The Headcoatees were Holly Golightly, Ludella Black, Kyra Rubella & Bongo Debbie, they released seven studio albums, a singles compilation and a split live album with Thee Headcoats. Thee Headcoatees played live along with Thee Headcoats from 1990 – 1999 when they split followed a year later by Thee Headcoats. Holly Golightly has gone on to release 13 solo albums and too many singles to mention, plus notable guest appearances on records by Rocket From The Crypt, The White Stripes and Mikabomb. Ludella Black was a founder member of legendary Medway band the DelMonas and has also released two solo albums with another planned for 2008 and is currently out on tour with The Masonics. Kyra Rubella released one solo album and singles on quite a few labels in the 1990’s, she also did a single with Armitage Shanks in 1996. Kyra is currently in The A-Lines along with Debbie and Julie from The Musicians Of The British Empire. Bongo Debbie is currently in various bands including The Buffets, The A-Lines, & Dutronc and before that was also in The Would Be Goods, Honey & The Hucksters, Baby Birkin and probably a lot more besides. Thee Headcoatees - Is There Any Chance Of You Coming Into My Life? Unfortunately at this time we can't offer all the Thee Headcoatees - Here Comes Cessation tracks as individual wavs, as some of these tracks exceed the shops maximum (9mins) download length.